Summer is off to a fresh start in our backyard with the addition of three new homemade deck benches. My husband kept his promise to finish off our deck by creating a corner seating area. He made the same bench as he had previously for our side deck. Plus he added another bench to the side deck. He’s no expert, but he’s pretty good at this stuff, so I asked him to share how he did it. Remember to wear your safety glasses and follow all safety instructions with your tools. Our benches are on low deck areas that don’t require railings. If your deck is higher, this design might not work for you. 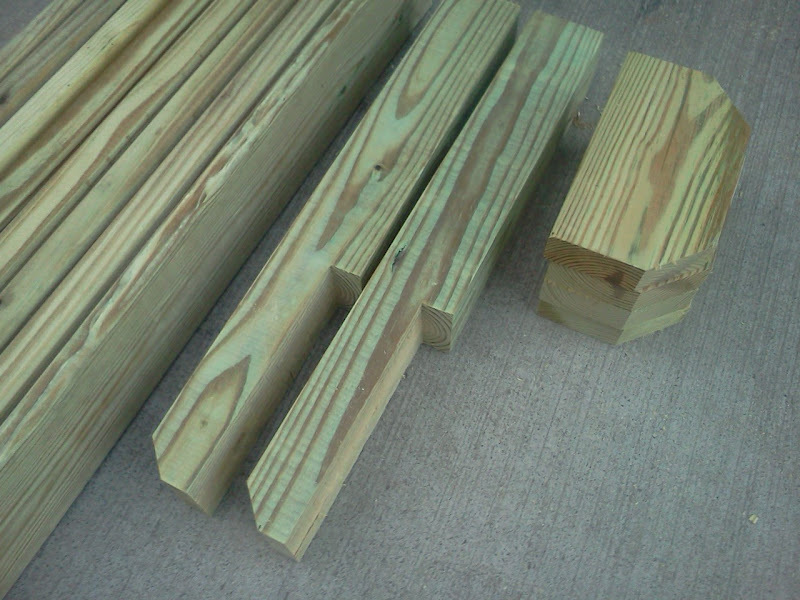 I would have preferred redwood or cedar, which are naturally pest resistant, but he insisted that pressure (chemically) treated lumber was all he could find locally in the sizes he needed. Cut 4″ x 4″s into two 26 1/2″ lengths. Notch out the bottom 10″ of the 4″ x 4″s, 1 1/4″ deep to attach to the deck. This made the height of the deck bench 18″ once the seat was attached. Notch out deck board so post will fit snugly on deck. Make holes with 5/8″ drill bit and bolt 4″ x 4″s to the deck (two bolts per post, 6″ bolts). Cut four 10″ lengths of 2″ x 6″s, bolt them on each side of the 4″ x 4″s perpendicular to the side with the other bolts. 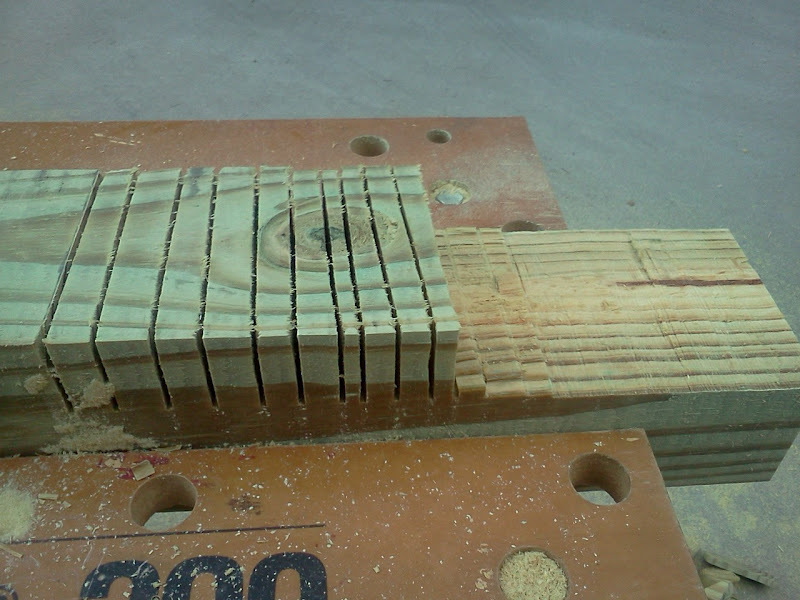 It helps to level and screw the 2″ x 6″s on first, then drill the holes for the two 8″ bolts. Cut 5/4″ board into two 10 1/4″ lengths (inside of miter measure) and two 47″ lengths (outside of miter measure) with mitered edges. Put on a flat surface and screw together to create rectangular box. Turn rectangular box with the best side down on a flat surface and cut six 2″ x 2″ board lengths to fit inside. Space boards evenly and screw into place. Place top onto posts, level, screw long sides of seat onto 2″ x 6″ cross members. Drill holes atop 2″ x 2″s, securing them to 2″ x 6″s. Insert a 10 1/8″ length of 2″ x 4″ across the center bottom of the seat. Run three rows of screws across the seat, inserting them in the middle 2 x4 as well as across the two legs. Use a Forstner bit to countersink the screws for a smooth seating surface. Tell hubby he did great Nice pictures and instructions. Tell girls hello and give them hugs.